Anyone remember the video game Rampage? It was one of my favorites. So one of my ideas lately is to combine some pictures of Cincinnati with monsters. Last year on our staycation the wife and I went on top of Carew Tower (for years was the tallest building in the city) and I took some snapshots. Unfortunately the cloudy day didn’t make the end result of the pic that great. 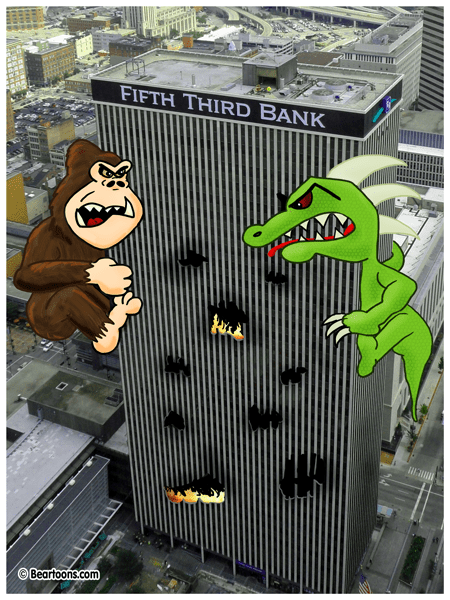 Yet when I saw the Fifth Third Tower in one of my pics it brought me back to pumping quarters into the Rampage game. Now of course I didn’t use the exact monsters from rampage but did my own version of a giant ape and giant lizard beating down a building. So what do you think? Not sure if I captured it well that they cartoon images actually belong in this scene with the coloring/shading choices I made. My wife didn’t think it mattered and loved it so much that for once she requested a print. Thoughts on making it better in future? It’s nice that the self-imposed comic publishing schedule is off you so you have the mental energy to branch out. I’m with your wife. I certainly get the gist of it! Trying new things Colleen and while my stats are half of what they used to be, I haven’t minded at all. Great job, man! I love the coloring on Kong. You did well, everything looks natural. You should do more stuff like this. That is the plan. I want to do an entire series. Yeah. It works just fine. No need to over-render the cartoon characters. Though, if you wanna try again, giving them a 8-bit look, in the future. That’d be pretty sweet, too. I like it just like it is too. I’m no pro at this, but I know what I like. RAMPAGE was the best damned game ever. Love this, Bearman! I don’t see what you are unsure of. It’s Great! That looks really good Bearman! What I really liked about that game is the fact you could play the same time as others and opt in mid game. No one ever opted in with me…they just let me die by myself. Don’t know the game but then my gaming days sorta ended with Ms. Pac Man and my last quarter. Seen one Kong, you’ve seen them all. Well there is King Kong and Donkey Kong…. I like the “combining” of “styles” that results from your coloring “decision”… Wait… WHAT!?!?!? All I’m saying is, I like it LOTS! You’re tearing it up, Bearman! Love it! I know this game. Me and my brother played this game 4 hours straight, and beat it. Oh but I did love that game. Hmmm… Good point. But the ape has ummm…. Well I bet you can guess my suggestion on how to make it better. But you never listen to me! You read my mind! Though a ravishing Wombie would be more apropos. They are always ravishing. Send me a Wombania (er Canada) picture and we can see. Okay, I will. But you asked for it! I do remember that game. I traded games with the neighbor kid for a while. I played his Rampage and then shortly gave it back to him. A couple of months later he, along with his mother, came over to the house and asked for it back. I was frustrated and then realized why my mother told me never to borrow other people’s games. I would be a whole lot organized about it now. Why not have a giant Bearman on the rampage too? What the ? Fifth Third tower? What does that even mean? 100 years ago the Fifth National Bank and the Third National Bank merged. I like this Bearman. I have used one like this. The Booger Bears club house is in a real cartoon picture. Great job on the characters. Thanks JB….Now I need to figure out the right sizing for printing in the future. Works together great, it’s fun to mix media like that but don’t do it too often. Can’t wait to see what else you come up with in this series. This is great, Bearman! All you need now is the Damage Counter and green helicopters. Thanks for inducing a childhood flashback! Feed the animals first next time. It might just be me, but they look kinda pissed.